British civil servant and monetary theorist. Ralph G. Hawtrey was educated Eton and Trinity College, Cambridge, with a B.A. in mathematics in 1901. 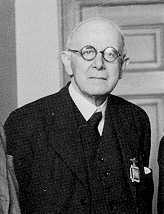 Although he never attended any of Marshall's lectures at Cambridge, Ralph Hawtrey has been considered a Marshallian economist. This might be right. Although Hawtrey worked at the Treasury most of his life, entering in 1904, Hawtrey's numerous writings on economics have a unmistakable Cambridge hue. Most notable is Hawtrey's contributions to the Cambridge cash-balance approach to money. An early friend of John Maynard Keynes, Hawtrey was also an early critic of the Treatise. In his most famous work, Hawtrey adopted Wicksell's cumulative process to derive his famous 1919 overconsumptionist monetary theory of business cycles. The Gold Standard in Theory and Practice, 1927. The Art of Central Banking, 1932. "The Credit Deadlock", 1937, in A.D. Gayer, editor, The Lessons of Monetary Experience. Bretton Woods, for better or worse, 1946. Cross Purposes in Wage Policy, 1953. "Keynes and Supply Functions", 1956.